It was a better time. It was the height of summer, and we weren't even thinking about digging coats out of storage. It was a time when Krispy Kreme made the Chocolate Glazed Doughnut in honor of World Chocolate Day (and in honor of the total solar eclipse before that). You can now relive that chocolaty, chocolaty day. At least, you can relive it every now and then. 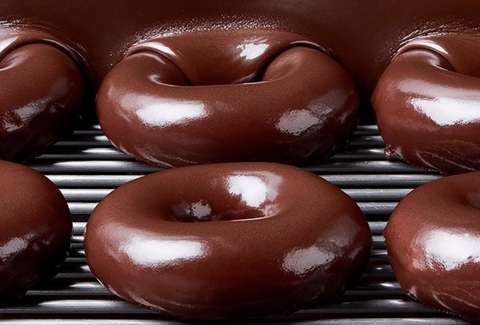 Krispy Kreme has announced plans to unleash chocolate-coated Krispy Kreme donuts on the world once more. It'll happen on the first Friday of every month at participating locations. The first first Friday? Well, that's this Friday, September 7. The donut is the original Krispy Kreme donut underneath a layer of chocolate glaze that replaces that traditional glaze. "We heard our fans loud and clear and they told us they want more Chocolate Glazed Doughnut days," said Alison Holder, head of U.S. marketing for Krispy Kreme. If this is your bag, you'll find a list of participating stores at the donut shop's announcement page. Each store will have the popular donuts until supplies run out. If it's anything like the last couple times Krispy Kreme released these, they'll go quickly.